Posted May 17, 2015 from Seattle, WA. Since I’ve been painting a third of a century now I’m looking back to resurrect paintings that I think were good ideas but that I never quite pulled off. It only works if I never sold the original or ruined it, and “Planning a Rollover” seemed like a perfect fit for this project. I’m at peace with the composition and the idea, but not the technical work I did when I called it quits on the painting the first time, I think that was back in the 90s. 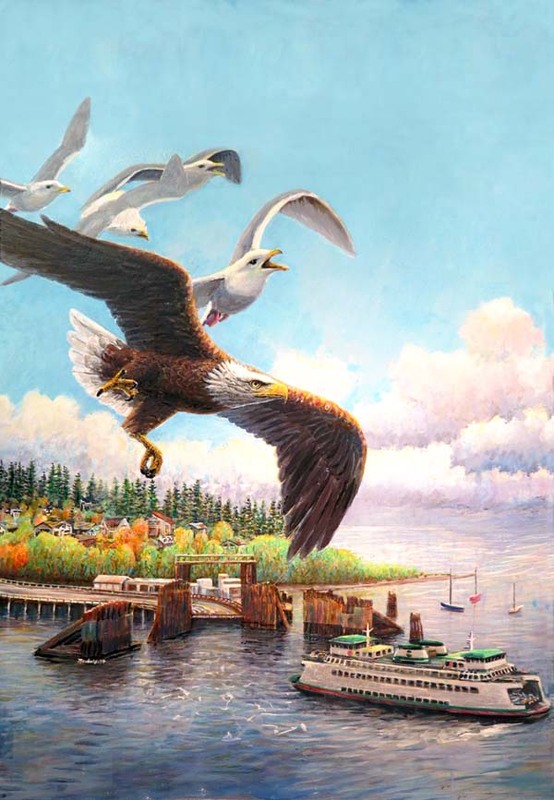 The painting shows Glaucous-winged Gulls, (that’s the big gull around here) bombing a Bald Eagle and the suggestion in the painting is that the Gulls should be careful as the Eagle is planning a “rollover” attack on the first one that comes too close. If you’ve ever seen a Bald Eagle do a sudden rollover on a Gull, it’s a very sobering sight. This is how it looks now. Feet and talons are notoriously tough to paint. Robert Bateman did a whole series of Crane paintings for a great book by Peter Mathiesson and managed to hide the feet in all but about one painting. That’s just another example of his genius. I’m going to try one more day to get these talons looking right, then bring the painting in to get it photographed. I’ve always wanted to get a Southwest series going. 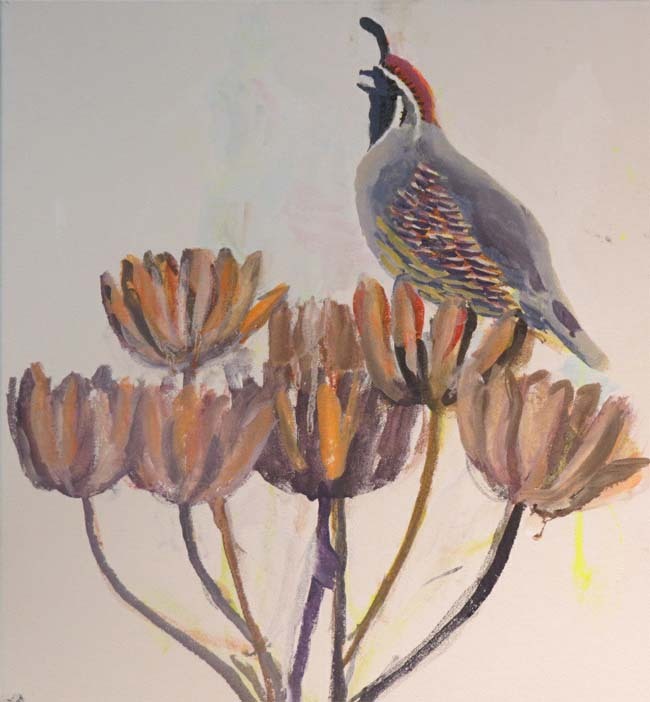 Here’s a start of a Gambel’s Quail on a dead Agave stalk that’s based on a shot I took last time down there, on this website at Sightings. Lots more to do on this. This could fit into a Southwest series, we just had a Bobcat hanging around the place in New Mexico that we are watching over. I’m going to argue with myself about this, hopefully I won’t ruin it. 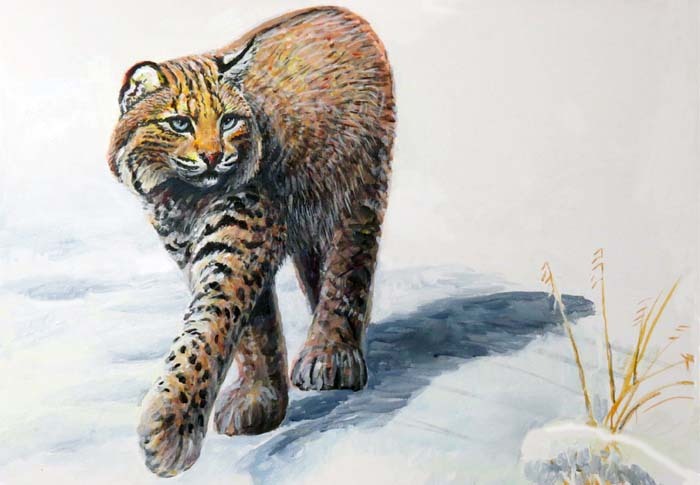 The cat looks a bit small and weak for a Bobcat right now. 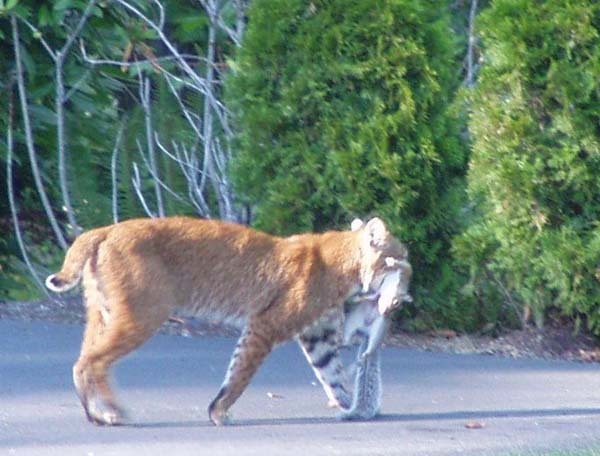 I’m putting this photograph of a Bobcat walking on a residential street in Bellevue (not taken by me, sorry I do not have his name) to show you what I meant by the last remark. The photo shows a lot of sinewy strength whereas my painting seems to show more of a lap cat. I’ll keep dinking around on it. Another makeover project I’m working on is the Duck Skinny. 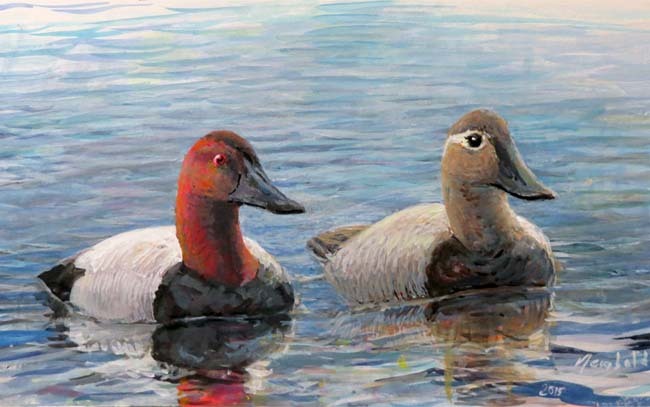 Here’s where the Canvasback painting is at the moment. Looking at this makes me realize the two birds are lined up too perfectly, I’ll have to move the female more to the perpendicular. 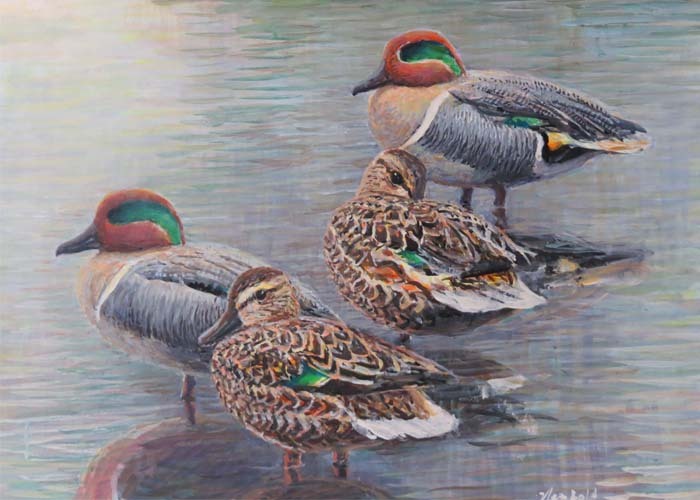 Here’s the Green-winged Teal painting. This works really well as the top of a skinny but as a larger painting it really needs work. These Wood Ducks have been bedeviling me. 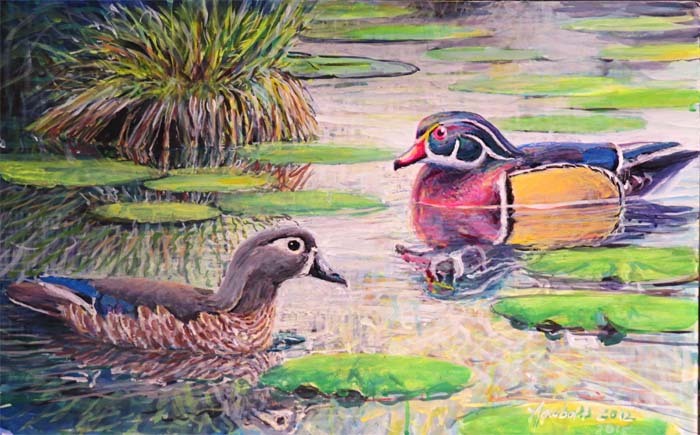 I don’t understand Wood Ducks aesthetically. 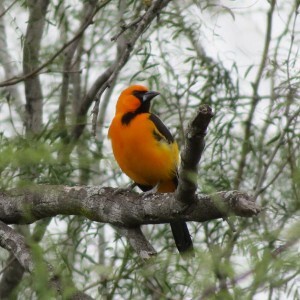 When I see them in the wild they strike me as athletic, dark and well-shaped. When I paint them or when I see them in calendar-style photography they tend to look gaudy and gawky, and I don’t know if I can meet the challenge that that presents, although I will keep trying. In any case, this should not hurt the skinny too much and should be superior to the current version pretty soon. I welcome comments but have to keep them turned off because of spam. I’d love them however, you’ll have to email me at ednewbold1@yahoo.com and let me know you’ve left one, I’ll make it visible. Sorry about that.